As I circulate within various Christian communities, and as I share a vision of what The Well might look like, I field a lot of questions. One question I hear frequently is, ‘What will the sermon be like?’ Sometimes, before answering, I will probe the questioner to see if I can determine what is prompting their question. 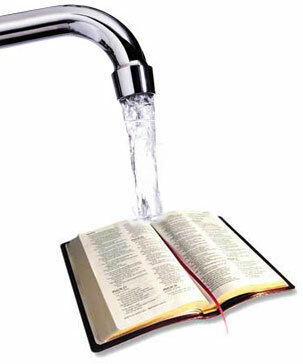 Almost always, the question is born out of a concern that ministries like The Well sometimes water down the Word of God in order to connect with the ‘unchurched’. I’m not in a position to speak for other ministries, although it wouldn’t surprise me if there were indeed ministries where the ‘sermon’ was largely stripped of biblical content. I suspect this after recently hearing of a ‘Seeker-sensitive’ ministry that actually did away with the sermon. That’s right, no sermon at all! It is my firm conviction that the message isn’t the problem. The decline of church attendance in Canada in the 21st Century is not the result of some failure of the Scriptures. The decline might have something to do with some failings within the pulpit. That is to say, the decline might have something to do with the approach and manner of the preacher. I am convinced, however, that an ably delivered message saturated with biblical content is NOT the problem. So when I’m asked the question, ‘What will the sermon be like?’, I eventually answer, ‘It will be a lot like what you normally hear from me.’ That is to say that the message will have its roots in the Scripture. The emphasis of the message will centre around Jesus Christ. Informality. I won’t be wearing a preaching robe. I won’t be standing behind a pulpit. The tone of the message will be more conversational. Vocabulary. The Well anticipates engaging folks with little or no church background. The Well anticipates engaging folks with little or no exposure to the Scriptures. Accordingly, I’ll need to tweak my vocabulary when I speak. For example, rather than throw around terms like ‘sanctification’, I’ll describe instead the process of becoming like Jesus. I am confident that communicators of the Gospel can accommodate their language without compromising the message. Part of my thinking here relates to the principle of relevance. I regard the Bible to be hugely relevant (2 Timothy 3:16), and I cringe when I hear Christians say that they want the preacher to ‘make the Bible relevant.’ The Bible doesn’t need me to ‘make it relevant’, it already is relevant! My task is to demonstrate the relevance of the Bible and, to do this, I need to be sensible with my vocabulary. I need to take steps to ensure that my hearers understand what I am saying. The approach of The Well may appear innovative on many fronts, but we will not innovate with God’s Word. We are working from the premise that the Gospel is the power of God unto salvation (Romans 1:16), and we are clinging to the notion that the Word of God is living and active (Hebrews 4:12). We absolutely will not water down the Word. The message isn’t the problem. The message is Good News. The message is the best kind of news. The message explains how we can fill the God-shaped void in each of us. I’m so eager to get that message out. We’re taking down some traditional layers to be sure, but for The Well, the layer of God’s Word remains central. This entry was posted in Ministry Update, The Bible by Bryn. Bookmark the permalink. I have to admit, I get really frustrated with people talking about the ‘watering down’ of the message. I suspect that this does not happen as often, in the type of ministry that The Well seeks to be, as some who are not comfortable with a move to a more contemporary style of worship would have us believe. I don’t doubt that there are places where it does happen, but I suspect that often this criticism is unfair and unfound. I suspect that it often has more to do with a discomfort about the call to reach those outside our walls than anything else. In the end, the gospel is a simple message: God loves and accepts you as you are, but God wants you to become more. God wants that so bad that He sent His Son to clear all the barriers between you and Him outta the way. So that you could live life in His presence. Simple, but deep. If that truth makes it into any message in a way that I can hear it and understand it, then the truth has not been watered down. Period. Continuing to pray for The Well, Bryn! Bryn, it is a common misconception that anything contemporary or seeker-sensitive is low on gospel. What they tend to be low on, actually, is complication. In this age of biblical illiteracy and post-Christian living, I would argue that in no setting – or, at best, in very, very few settings – could one toss around a word like “sanctification” and find it understood by even a bare majority, let alone everyone. Even biblical allusions, nevermind theological terms, are lost on contemporary society. For example, when the coach of Your Beloved Leafs was terminated on Wednesday, the pundits were all saying that “the writing was on the wall”. How many people, save some Christians and a few English literature majors, would have known that the heritage of th at phrase is from the Old Testament? I’ve been arguing in a thread on The Presbyterian Church in Canada group page on Facebook that how we worship must be accessible to the people whom we may see as our ‘target market’. Worship is for God, of course, but if the people who come to engage therein aren’t engaged, then we haven’t done our job as leaders: the people haven’t had an experience of God. There was a time when the church could expect to raise people’s standards, whether in music or grammar or vocabulary. I believe that time is gone. All the more reason we need to make the gospel accessible to everyone by speaking in their terms. Rebekah / Jeff – Thanks for the lengthy, thoughtful, and encouraging ‘comment’ submissions. Heather–what a great quote! Thanks for sending along that gem. I may very well use that quote in a future post. Tom–I’m totally with you–thank-you for your comment! I’ve just emerged from a gathering/meeting of leaders for The Well. One of the things we talked about again tonight was the need for the centrality of Christ to mark each message. I beginning to realize that I’m a bit of an enigma, in terms of my approach to ministry. I’m ‘all in’ when it comes to the tenets of reformed theology. At the same time, I hugely value the wisdom of being strategic (i.e. sensible!) in reaching out to the ‘unchurched’ and barely churched. Cliff Cline posted a John Piper link which is immensely helpful to this discussion. I’ll post that video shortly. I’ll be praying for you and tracking with interest this excellent venture.